Make Your Vote Count - Part 3 Voting in the Senate - Rite-ON! Part 1 explained how to make sure that your ballot paper is completed in accordance with the Australian Electoral Commission (AEC) requirements and NOT rejected as Informal. It also introduced the importance & the power of preferences in changing outcomes. Part 2 explained Australia’s House of Representatives compulsory preferential voting system in more depth, and how preferences distribute to candidates in determining the final winner in the 2 Candidate Preferred (2CP) count. 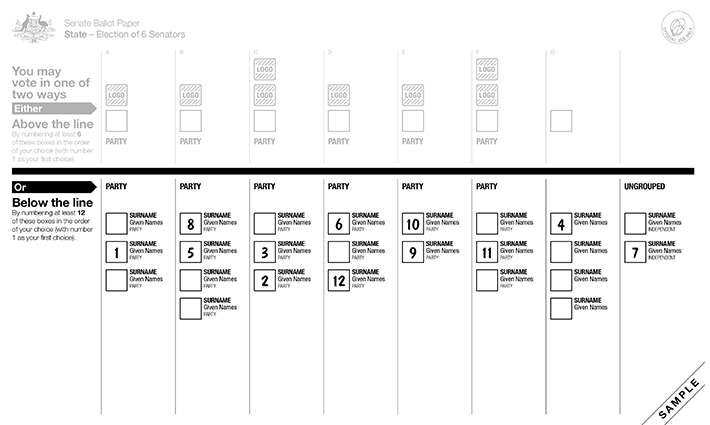 Now that the 2 easy parts are understood, Part 3 unwraps the voting system & counting methodology used to elect Senators to Australia’s Upper House of review, the Senate. 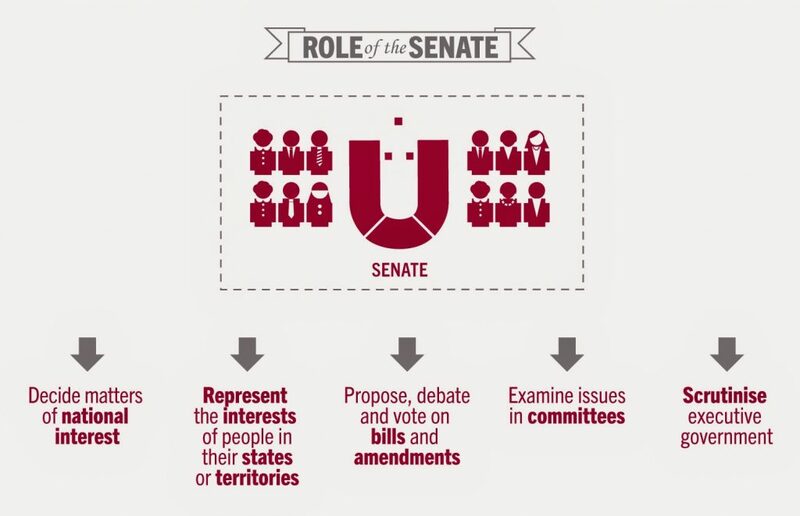 WHY HAVE A SENATE & HOW IS IT DESIGNED? Let’s look at the House of Representatives (the House of Government) first though, to answer this question. Australia is divided into electoral divisions and the constituents of each electoral division (electorate or seat), elect one Member to represent them in the House of Representatives. The aim is to ensure that electoral divisions within each State and Territory contain approximately an equal number of electors. Electoral boundaries are reviewed regularly and, if necessary, adjusted (redistributed) to reflect population changes. With Australia’s uneven population distribution, electoral divisions differ greatly in area from, for example, 32 sq. km (Grayndler, NSW) to over 1.6 million sq. km (Durack, WA). At September 2016 electoral divisions averaged approximately 105,207 voters per electorate. The 2 most populous States still command a majority 84 of the 150 seats. 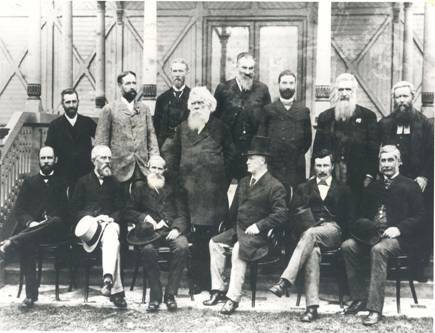 In recognition, delegates from the colonies gathered for conventions in 1890/91 and devised a constitution for a federated Australia, which made provision for a Senate intended to equitably represent the States, and to adequately protect the interests of ALL States in the federal parliament. It was decided that ALL states regardless of population & geographic size should have equal numbers of elected Senators, and that the Senate would have strong powers to enquire, scrutinize, review, amend, accept or reject proposed legislation from the House of Representatives. The Senate consists of a total of 76 Senators. 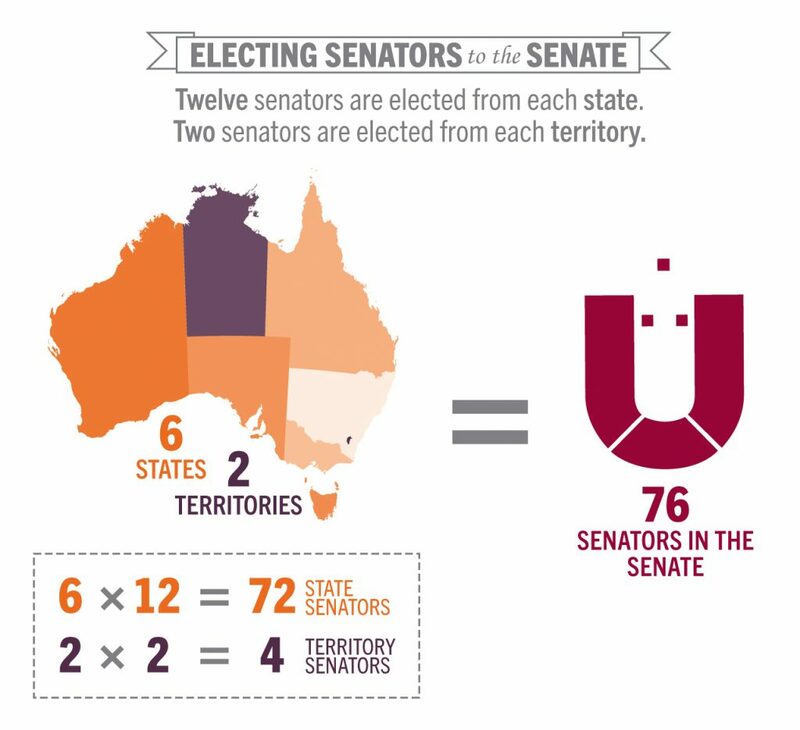 Each of the 6 States has 12 Senate positions each with six-year terms, and the territories (ACT & NT) have two positions each with only ever three-year terms. Half of the State senate positions (36) and the territory positions (4) are declared vacant at each normal general election. This will be the case in the 2019 election – 40 senate positions will be decided. The exception is an election following the double dissolution of a parliament, when all House of Reps (150) & all Senate positions (76) are declared vacant. Then half of the State senators (36) are elected with 6-year terms & the other half with 3-year terms until the next normal general election. The 4 territories senators are still only elected for 3-year terms. This occurred after the double dissolution of parliament in the 2016 election. Proportional Voting is used in multi-member electorates (e.g. States), and is used for Australian Senate elections. Each voter has a single transferable vote (STV) that along with the optional preferential methodology attempts to ensure that members elected in each State have received and equal proportion of votes. This feature distinguishes it from most proportional representation systems in use throughout the world. It requires winning candidates to secure a quota of the vote. The quota is calculated by dividing the total number of formal ballot papers by one more than the number of Senators to be elected, and adding “1” to the result (ignoring any remainder). In the upcoming 2019 half-Senate election of 6 Senators per state, the quota will be 14.3% of the formal vote. 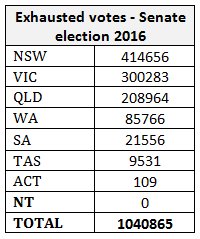 In the 2016 double dissolution election of 12 Senators per state, the quota was 7.7% of the formal vote. The territories always elect 2 senators each, so the quota remains same for them for both normal & double dissolution elections. 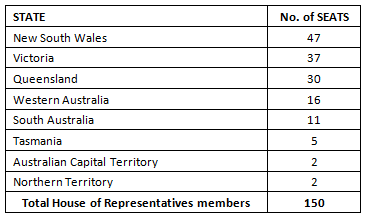 The table below shows the quotas required in the 2016 election & an approximation of quotas required to be elected to the Senate in the 2019 election. WA Quota 2016 = [1,366,182 formal votes cast/(12 seats + 1)] + 1 = 105,091 or 7.7%. WA Quota 2019 = [1,407,167 votes/(6 seats + 1)] + 1 = 201,024 or 14.3%. With almost double the votes required to secure a quota in 2019, less popular minor parties & Independents will find it much harder to be elected/re-elected in 2019. A FEATURE THAT WILL MAKE MAJOR PARTY POLLIES SMILE WITH GLEE. 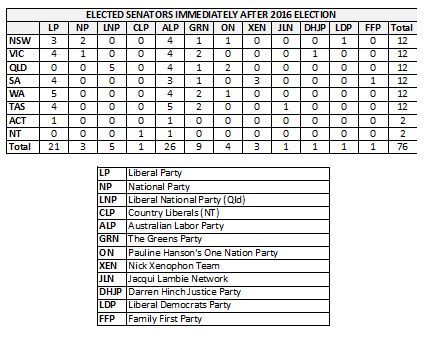 Immediately following the 2016 Double Dissolution election, the Senators elected & party representation were as per the following table. On the white Senate ballot paper, a voter must either vote Above The Line (ATL) or Below The Line (BTL). 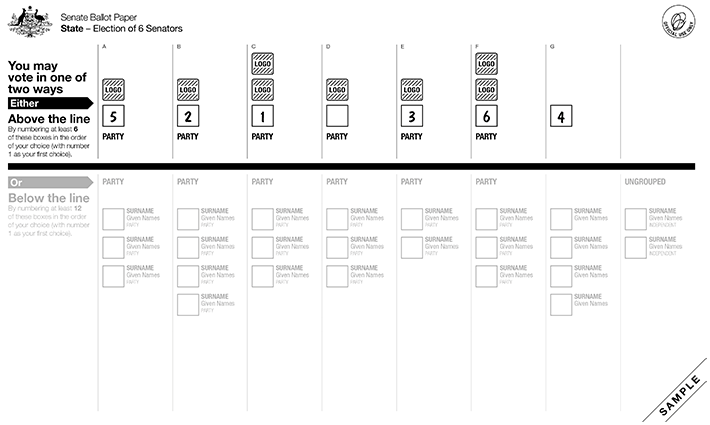 If voting ATL the Australian Electoral Commission (AEC) advises to number at least six boxes for the parties in order of your preferred choice as shown on this sample below. Place a 1 in the box for the party that is your first choice, the number 2 in the box above the party that is your second choice and so on until you have numbered at least six boxes above the line. You can continue to place numbers in the order of your choice in as many boxes above the line as you like (more on this later). The party decides the order in which candidates within their own party receive the ATL 1st preference vote & the order in which surplus ATL votes are distributed to their other candidates, should a party candidate be elected with a quota or excluded. This is called the party ticket order and is generally the top to bottom order of candidates below the line immediately under their party name. If all of the particular party candidates are elected or excluded, the STV transfers to the candidates of the party next numbered ATL on their voter’s ballot paper until the STV elects a candidate or preferences on the voter’s ballot paper are exhausted. If voting Below The Line (which Rite-ON! recommends), the AEC advises to number at least 12 boxes for individual candidates in order of your preferred choice as shown on the sample ballot paper below. 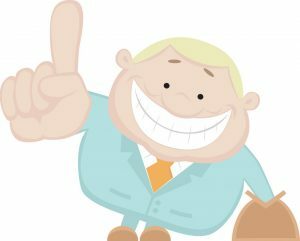 Place a 1 in the box beside the candidate that is your first choice, and the numbers 2, 3, 4 and so on to at least the number 12. You can continue to place numbers in the order of your choice in as many boxes below the line as you like (more on this later). Should a candidate be elected or excluded, surplus preference votes transfer to the candidate next numbered on the ballot paper. The process would continue until the STV elects a candidate or preferences on the voter’s ballot paper are exhausted. The count process firstly ELECTS candidates who have achieved a quota. Candidates who are elected have the surplus votes from both ATL & BTL transferred to the next preferenced candidate or party group of candidates. When NO remaining candidate has a quota, candidates with the lowest votes are then EXCLUDED & the votes transferred in accordance with the indicated preferences. STEP 1 – ELECTION. The 1st Preference votes for each candidate are counted. These are the votes for candidates with a number 1 BTL plus the first candidate of the ATL parties numbered 1. Three candidates have more than a quota. Mathias Cormann, the number 1 on the Liberal Party Ticket has the highest votes of 521,420. Next is Sue Lines the number 1 on the ALP party ticket with 379,352 votes, then Scott Ludlam, the number 1 on the Greens party ticket with 142,078 votes. So ends Count 1, with these 3 candidates declared ‘elected’. The ATL surplus votes and preference votes BTL from Mathias Cormann are now transferred. 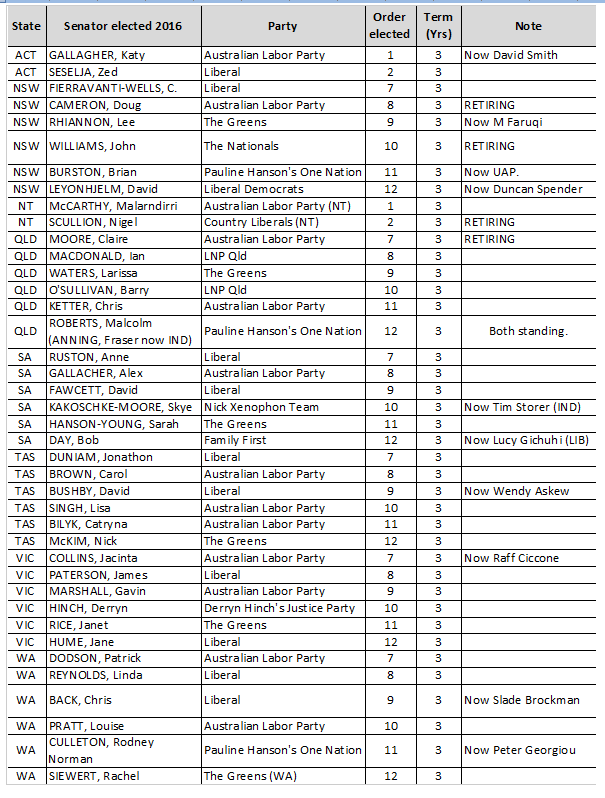 The surplus (ATL party votes – Quota) is transferred to the next candidate on the Liberal Party ticket Michaelia Cash (i.e 510,870 – 105,091 = 405,779 votes transferred). Michaelia Cash also receives transferred preference votes from Mathias Cormann’s BTL votes where she was preferenced number 2. This resulted in a total transfer of 414,542 votes to her, and when added to her BTL 1st preference votes of 1,383, Michaelia Cash’s total after Count 2 is 415,925 votes. This is more than a quota and she is now declared ‘elected’. This process continues and from the table above it can be seen that after 7 counts, EIGHT candidates are declared ‘elected’. 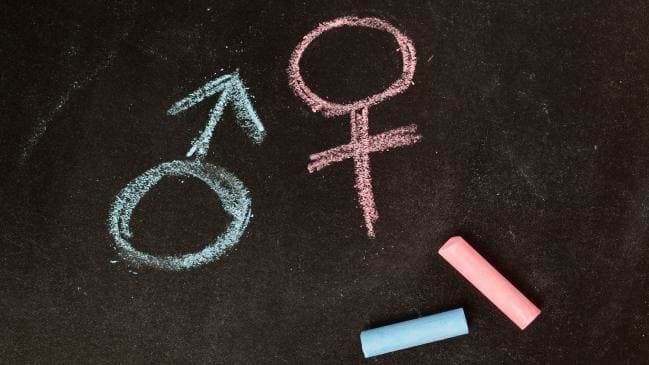 STEP 2 – EXCLUSION & ELECTION. After count 7 and the transfer of surplus ATL votes & BTL preferences, the candidate with the highest number of votes is Chris Back of the Liberal Party with 101,550, but this is NOT a quota. It actually required 50 candidates to be excluded & their preferences distributed before Chris Back received a quota at count number 378 and was declared the 9th candidate ‘elected’. His remaining 11 votes transferred to the next indicated preference on the voter ballot papers. This exclusion process & transfer of ATL surpluses & BTL preferences continues until 12 candidates are elected. A further 15 candidates were required to be excluded & preferences distributed before Louise Pratt (ALP) is the 10th candidate declared ‘elected’ at count number 528. The final two candidates Rod Culleton (One Nation) & Rachel Shewert (Greens) were both declared ‘elected’ at the final count number 539 after another 16 candidates were excluded and preferences distributed. HOW IS IT DETERMINED WHICH SENATORS GET WHAT TERMS? The first 6 in each State who were declared ‘elected’ in the 2016 count secured 6-year terms, and will remain in the Senate for another 3 years until 2022. The last 6 who were declared ‘elected’ in the 2016 count only secured 3-year terms, and now face the electorate again in 2019. The 2 Senators in each of the Territories face the election every 3 years regardless. Therefore the 40 Senate positions with only 3-year terms will be declared vacant for the 2019 election. The full list of these 3-year termers is in the following table (sorted by State, and then by ‘Order Elected’). NOTE the number of casualties & changes of the 3-year termers since 2016! If a voter indicates 6 minor parties Above The Line (ATL), it is possible that ALL 6 parties’ candidates may get excluded and with no further preferences indicated on the ballot paper, your ATL vote would EXHAUST with no candidate receiving your vote. Similarly, if 12 less popular Independents or minor party candidates are indicated Below The Line (BTL), ALL 12 could get excluded and your BTL vote would ‘EXHAUST’. In the 2016 election over 1 million votes expired for this very reason. This mainly occurs at the later counts as minor party candidates & Independents are excluded. It also probably happens inadvertently rather than with deliberate voter intent. This could make a significant difference to outcomes if voters are aware of this risk, and actually number more than 6 ATL and more than 12 BTL particularly if numbering less popular minor parties and/or Independents. The Senate is an Optional preferential System – remember you OWN your preferences and preferences make a huge difference, so preference as many candidates as you want to make sure your vote counts! You can continue to place numbers in the order of your choice in as many boxes ‘above the line’ or ‘below the line’ as you like. Keep numbering until you are reasonably sure that your vote WON’T EXHAUST. If a candidate relies on some BTL votes to achieve a quota, which of the BTL ballot papers are used to elect the candidate, and which BTL ballot papers are transferred to the next preferred candidate? Similarly with ATL votes, which ballot papers marked 1 ATL are used to elect a candidate and which ballot papers are transferred to the next preferred party? Different ballot papers would have different orders of preferences. How is this decided, and does it keep the system truly democratic? Any surplus votes from elected candidates (votes in excess of the quota they need), are transferred to the candidates who were the second choice of voters on those ballot papers. 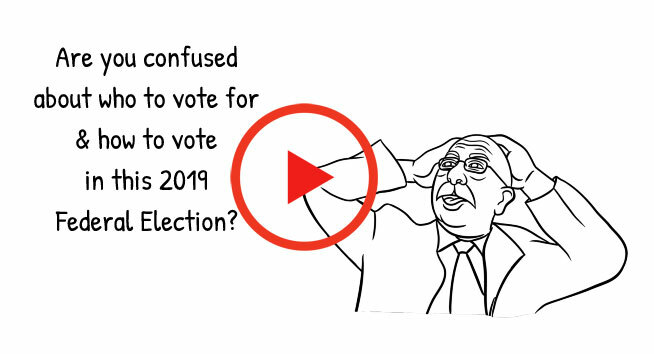 Because it is not possible to determine which votes actually elected the candidate and which votes are surplus, all the elected candidate’s ballot papers are transferred at a reduced rate. Candidate A gains 1,000,000 votes. If the required quota was 600,000 the surplus would be 400,000. Candidate A’s ballot papers (1,000,000) are then re-examined in order to determine the number of votes for second choice candidates. If candidate A’s ballot papers gave 900,000 second preferences to candidate B, then candidate B would receive 360,000 votes (900,000 multiplied by the transfer value of 0.4). These votes would be added to the votes candidate B received in the first count. First Past the Post v Compulsory Preferential v Optional Preferential. Compulsory Voting v Non-compulsory voting. 2 Candidate Preferred counting methodology v Other ways to count & determine the winner democratically. Photos ID & a centralised Digital Electoral Roll to prevent multiple fraudulent voting. has unwrapped the mysteries and vagaries of the Senate voting system & vote counting for you. 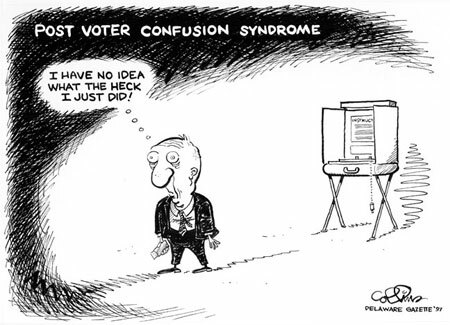 is useful in deciding how to make sure that your vote is counted and that your vote counts, avoiding ‘POST VOTER CONFUSION SYNDROME’. If voting Above-The-Line (ATL), Rite-ON! recommends numbering more than 6 boxes to lower the risk of your vote being exhausted. If voting Below-The-Line (BTL), Rite-ON! recommends numbering more than 12 candidates to lower the risk of your vote being exhausted, especially if voting for minor party candidates and/or independents. The senate is an important ‘house of review’ preventing damaging legislation passing through the parliament and becoming law. Vote carefully! A properly cast vote in the senate is your political insurance policy – so make sure it is counted – and make sure it counts! Rite-ON! will release online digital Senate How-to-vote cards for each state. These will reflect our values and campaign issues. Stay tuned to our website as the 2019 election nears. previous post: GetUp – Purveyors of Hate and Division? next post: Which PM will YOU or your candidate choose?